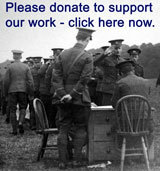 Donate now to the King's Own Royal Regiment Museum use the 'donate now' facility. 2014 marks the centenary of the start of 'The Great War for Civilisation' fought initially in Europe, but quickly to become the first world-wide war. The King's Own Royal Regiment Museum have plans to tell the story of the Regiment, the soldiers, and their families through the war; as well as to mark certain battles and special anniversaries. We intend to do this through exhibitions, events, talks, publications, our website and other activities. We also hope to be able to engage with local schools, as we have been doing for years, to ensure that the Great War is remembered in a fitting and appropriate way by the youngest generation. In order to fulfil all of our plans, and our continued aim of telling the Regiment's story in The Great War (we're not new to this we've been doing it since 1929!) we will need to generate additional resources. We are looking for donations and sponsorship to help us raise the money we need. This is where you can help. Every pound donated will help us tell the story of the King's Own Royal Lancaster Regiment and the Great War. Donate - simply donate money to our appeal which will be put to good use in one or more of the exhibitions or activities we plan. Your donation will be acknowledged in our exhibitions and on our website. You may request a memorial acknowledgement such as "To the memory of Private Matthew Farrell, who fell with the 1st/5th Battalion during the Great War, April 1915". You can donate using Paypal via this link: Donate now to the King's Own Royal Regiment Museum. Using the 'Donate Now' facility. The museum receives 100% of your donation. Sponsor - you can sponsor a particular event, exhibition (or part of) and your name, or the name of the King's Own soldier will be acknowledged. There are a range of opportunities, starting at only £100. If you would like to sponsor an exhibition please get in touch. We are looking for a sponsor for our 2014 Major Exhibition; but also have opportunities for smaller exhibitions through the Centenary years. These will include topics such as the Territorial Force Battalions; the campaigns in Gallipoli, Mesopotamia and Salonika. We are planning to have a working model railway based upon Didcot in September 1914, where the 5th Battalion was initially sent to guard lines of communication - we are looking for sponsors to help us with the building and running cost, please get in touch if you are interested. Please get in touch to ask for further details. Cheques payable to "King's Own Royal Regiment Museum" or pay on line using Paypal: Donate now to the King's Own Royal Regiment Museum. Using the 'Donate Now' facility. The museum receives 100% of your donation. Telephone the Curator on 01524 555619 to donate using a credit or debit card. If you are a tax payer we can benefit even more when you 'Gift Aid' you donation - at no cost to you we can claim the tax you have already paid - valued at 25%! Gift Aid Note: By signing the donation form you confirm you have paid or will pay an amount of Income Tax and/or Capital Gains Tax for the current tax year (6 April to 5 April) that is at least equal to the amount of tax that all the charities and Community Amateur Sports Clubs (CASCs) that you donate to will reclaim on my gifts for the current tax year. You understand that other taxes such as VAT and Council Tax do not qualify. You understand the charity will reclaim 25p of tax on every £1 that you have given. Please notify the museum if you want to cancel this declaration; change your name or home address; and/or no longer pay sufficient tax on your income and/or capital gains.